Hi there! You guys, I have been SOOO excited for this day to come! We have had such an awesome response to this Sew Along --- and I feel super grateful you guys are joining me on this fun little sewing adventure for the next few weeks! Let's get started! Please read ALL instructions before starting. Please measure twice and cut once - I have made the cutting instructions very specific - and there IS NOT a lot of room for cutting errors - so PLEASE BE CAREFUL! I am posting the blocks for the quilt in no particular order - to keep this EXTRA MYSTERIOUS! Accuracy is KEY! This quilt requires you to be very accurate with your piecing - A 1/4" quilting foot is recommended for piecing. I used a "scant" 1/4" seam for this quilt. I have made the entire quilt already (and it is sooo cute!!) - and so all blocks and piecing have been tested. This is all about having fun!! This was a joy to design and it was even more fun piecing this quilt! I can't wait for the final reveal! Alright, I think you guys are ready to get started! First, I have included a cutting sheet. This sheet is cutting for the ENTIRE QUILT. It is very helpful if you mark all your pieces with the letters I have assigned each piece. Please measure twice and cut once! There is nothing worse than making a cutting mistake! So pay careful attention please! 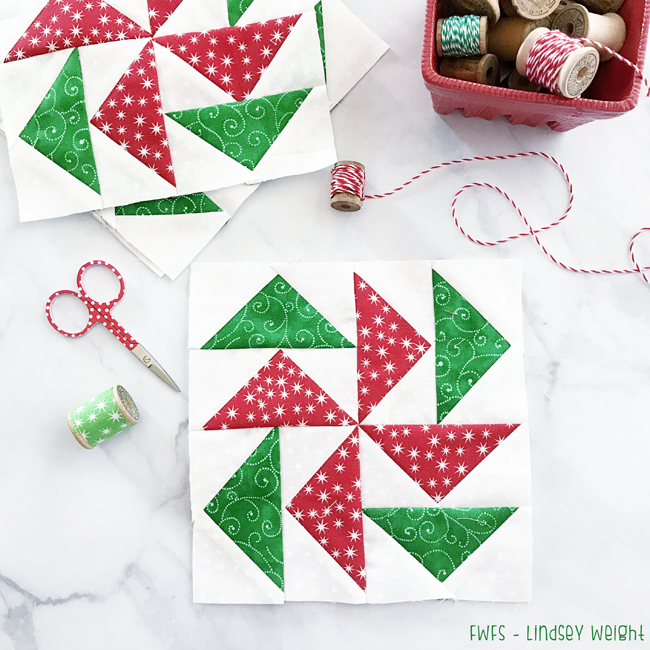 Be sure to post your pics on Instagram and use the hashtag: #ChristmasMysteryQuilt --- we want to share your pictures on our Instagram page! That's it for this week! Come back next Thursday for block 2! So gorgeous fabrics.Thanks for the tuto. Is it mentioned anywhere how much of each different print is needed to make the whole quilt? I know you offer a kit, but what if we want to work from stash? Hi Kathy, the cutting instructions have the amounts required below the swatches! Glad you are sewing along! I am unable to get the 1st download cutting sheet . It just comes up as a blank page. How can I get it??? Hi there, I'm sorry you are having trouble downloading the cutting sheet. 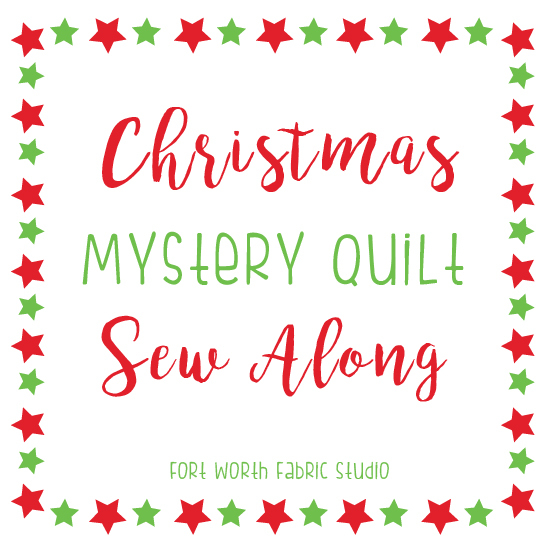 Please email me: lindsey@fortworthfabricstudio.com and I can send you the link/pattern. I'm ready for block #2!! My completed block for #1 was 8.5 inches. Is that going to be a big difference in the completed quilt?? Another question Lindsey, could we make 2 blocks with red pinwheels and 2 blocks with green pinwheels? Would that skew the pattern for the overall quilt??? So glad you are sewing along with us! All the blocks in the series are going to measure 8" x 8" unfinished - but if all of your blocks are 8.5" x 8.5" that should be fine - as long as you are consistent. Hope this helps! Lindsey, have you posted block #2 yet? I haven't seen it on the website. Please advise.